Finally a delicious use for one of the world’s strangest bitter substances. I read recently in the Atlantic that of all of the Fernet Branca sold in the US, 25% of it is sold in San Francisco! For a drink that makes so many people gag on their first sample, it is pretty remarkable that so much could be sold in one place. For anyone not experienced with Fernet, it is a super bitter amaro that is made from a bewilderingly large number of spices and herbs including myrrh, chamomile, and saffron, and it tastes a bit like a mixture of toothpaste and cough syrup. Generally speaking most bartenders I know enjoy it. My guess is that dealing with an increasingly cocktail-aware audience of bar patrons, bartenders have to like something pretty weird to stay ahead of the curve. Either way, count me in – I love Fernet. I enjoy pretty much all bitters and amari, but there is always a special place for Fernet with me. Though try as I might I could never find a cocktail that it would work in. At one point I was feeling like I was homing in with an unnamed combination of honey, fernet and rye but it just wasn’t perfect… the fernet is just so shouty and overpowering nothing else could compete with it. But then one evening while flipping through the 2008 Food & Wine Cocktails book and came across one of what is presumably Jamie Beaudreau’s concoctions called the Cooper’s Cocktail. 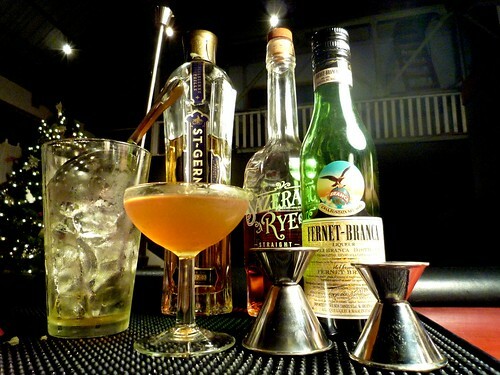 It is a blend of Fernet, Rye and St Germain, and the St Germain and orange twist really do their job to balance out the Fernet. Stir all ingredients except orange peel with ice and strain into a chilled cocktail glass. Twist orange peel over the glass and then drop it into the drink. This entry was posted on Monday, December 8th, 2008 at 8:07 pm	and is filed under Books, Ingredients, people, Recipes. You can follow any responses to this entry through the RSS 2.0 feed. Both comments and pings are currently closed.